The year is 1822. 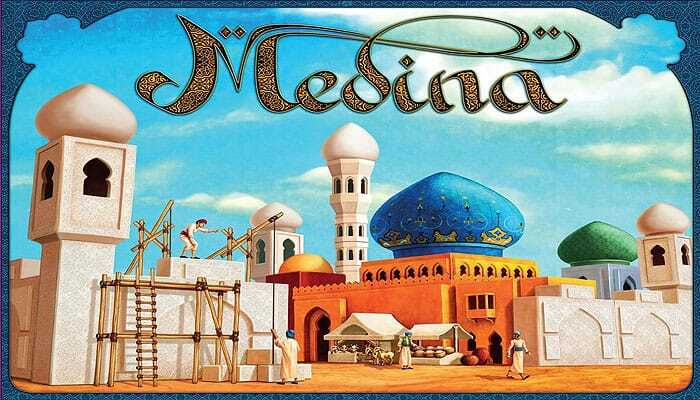 After years of decay the decision is made to rebuild the medina located at the foot of the Atlas mountains. The players work together to erect large and beautiful palaces and to renovate the damaged city wall. Life returns to the old city. People flock through the alleys and the contours of the new city gradually start to appear. 1 Place the game board in the middle of the table. Use the side with the large game area (11x16 squares) in a three- or four-player game Use the side with the small game area (10x14 squares) in a two-player game. 2 The four white towers are placed on the four corners of the city wall. Place the four tower tiles next to the corresponding towers. 3 Place the well on a random space inside the city, at least one space away from the wall. 4 Place three merchants on the tower tile with number 1, two merchants on the tower tile with number 2 and one merchant on the tower tile with number 3. 5 Place one merchant on a random space inside the city, at least one space away from the wall. 7 Place the six tea tiles in a stack face up next on the top left space on the game board. 2 Players: 8 buildings of each color (32 in total), 4 rooftops in their playing color, 4 stables, 12 merchants and 15 walls. Both players receive 2 rooftops in a third color. Each player thus has 6 rooftops. Example: Player A (red) has four red and two yellow rooftops; player B (blue) has four blue and two yellow rooftops. 3 Players: 6 buildings of each color (24 in total), 4 rooftops in their playing color, 4 stables, 8 merchants and 12 walls. Each player additionally receives 1 rooftop in the remaining color. 4 Players: 5 buildings of each color (20 in total), 4 rooftops in their playing color, 3 stables, 6 merchants and 9 walls. Each player keeps their game components hidden behind their player screen with the exception of the rooftops, which are placed in front of the player screens. Return all unused game components to the box. 9 Choose a starting player. During the game each player takes possession of four palaces, one of each color. Each palace consists of one or several buildings. The larger the palace, the more points it yields at the end of the game. Players receive additional points when their palace borders the city wall, features stables and is adjacent to a market street or near the well. The winner is the player who scores the most points at the end of the game. The starting player begins the game. After he has taken his turn, the next player, in clockwise order, takes his turn. 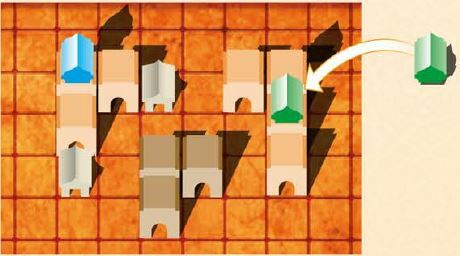 The active player places two of his wooden components (building, rooftop, stable, merchant or wall) on any empty space on the board. Play then continues to the next player. The two placed components can be of any type (same or different) and of any color (same or different). 2 Player Game: The starting player places only one wooden component in his first turn. 3 or 4 Player Game: The first two players place only one wooden component in their first turn. Buildings are used to construct palaces. A palace consists of buildings in the same color (and stables). All players work on the different palaces together. A palace does not belong to any player as long as it has no rooftop. The first building of a palace can be placed on any empty space on the board. You can only start a new palace if no palace of that color is already starting to form on the board, all palaces of that color already have a rooftop or all palaces of that color can't be expanded anymore. If a palace of the same color without a rooftop exists, any player play- ing a building of that color must built adjacent to this palace. This means it needs to be placed on an orthogonally adjacent space. A pal- ace can become quite large when many buildings of the same color are placed next to each other. Two palaces always need to be separated from each other. The mini- mum distance between two palaces is one empty space (both orthogonally and diagonally). This means there has to be room for an alley between 2 palaces. If a building cannot be built adjacent to an existing palace because of lack of space, a player can use this building to begin a new palace in the same color. This building can be placed on any empty space within the walls on the board. If a player takes possession of a palace (see 'Rooftops'), it is no longer allowed to add new buildings to that palace. If a player plays another building in this color, a new palace is erected. Rooftops are used to take possession of a palace. If a rooftop is placed on top of a palace, the palace has reached its final size and no more buildings can be added to that palace. 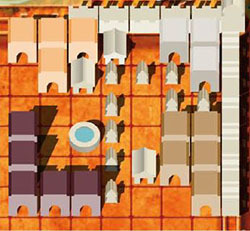 Each player has four rooftops in their color and can claim four pal- aces during the game, one palace in each of the four colors. The size of a palace is determined by the number of palace pieces and attached stables. Each building or stable is worth one point. So, if a palace consists of four buildings and one stable, it is worth 5 points. The value of a palace increases when it is directly adjacent to the city wall, borders a market street or is close to the well. Example: Blue decides to take possession of a palace. He must choose the brown palace since he already placed one of his rooftops on an orange palace. Now the brown palace has been claimed, a new brown palace will be started when a player decides to place a brown building. If all players have claimed a palace in the same color, no more buildings in this color can be built. All players must return any buildings in that color from behind their player screen to the box. So if, for example all players have claimed a brown palace all brown buildings are returned to the box. 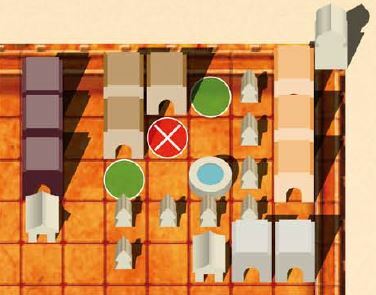 2 or 3 Player Game: Each player also has one or two rooftops in a neutral color. If such a neutral rooftop is placed on a palace, the palace does not belong to any player and neither player will score points for it. Rooftops in a neutral color can be placed on any palace. It is for example allowed to place a neutral rooftop on a grey palace even if there is already a neutral rooftop on another grey palace. When all players have claimed a palace with a rooftop in their color, all buildings in that color behind player screens are removed from the game, even if a palace isn't claimed with a neutral rooftop. Stables are used to expand palaces and can be added to any palace. A stable can only be built directly adjacent to a building. A stable can be placed adjacent to a palace with or without a rooftop. When building a stable, players need to take into account that there has to be at least one empty space between the stable and any neighbouring palace. Stables can be added to any palace, it doesn't matter should the palace belongs to another player. Important: This way players who do not build their stables in time, may be forced to build their stables adjacent to palaces belonging to other players due to lack of space. Each stable increases the value of the palace in question by one point. A stable is part of a palace. So if the stable borders the city wall, a market street or is near the well, the value of the palace increases accordingly. Example: The player decides to place a stable. He can choose from four spaces to place the stable. Two spaces are only adjacent to an- other stable, so no stable can be placed there. Also, no stable can be placed on a wall space. Important: Players normally build a stable adjacent to their own palace to increase the value of this palace. However, sometimes its a good option to build a stable next to the palace of another player, for example to limit the number of free spaces. Merchants represent the markets in the city. At the start of the game one merchant is placed on any space on the board. During the game a long and extremely busy market street will be made in the alleys between the palaces. Merchants must be placed orthogonal adjacent to a merchant already present on the board. Newly placed merchants are always adjacent to one merchant at the beginning or the end of the market street and may never be adjacent to two merchants. When the market street hits a dead end at one side, it is only possible to add merchants at the other side. If it is impossible to add merchants on both sides, the active player can place a new merchant on any free space on the board and a new market street comes into existence. Each merchant adjacent to a palace increases the value of the pal- ace in question by one point. Example: The player decides to place a merchant. He needs to add a merchant at the beginning or at the end of the market street. He has three possibilities to do so. He cant place a merchant adjacent to two other merchants. Walls are built to protect the city. At each side of the wall, there will be a free space for the gate to enter the city. Walls are built on the wall spaces surrounding the city. All walls must start adjacent to a tower. If a player builds a wall, he needs to build it adjacent to one of the four towers or adjacent to any existing wall. Walls originating from two different towers must always be separated from each other by at least one free space (called a gate). This means that the last space between 2 walls must remain vacant. You can build a wall next to any palace, assuming the wall is connected to a tower. It doesn't matter whether it has a rooftop or not. Each wall adjacent to a palace increases the value of the palace in question by one point. When a player takes possession of a purple palace, he receives tea tiles. These tiles can be used to skip placing a component during a turn (tea break). The first player to take possession of a purple palace receives three tea tiles. The second player to take possession of a purple palace receives two tea tiles and the third player receives one tea tile. The fourth player gets no tea tiles. 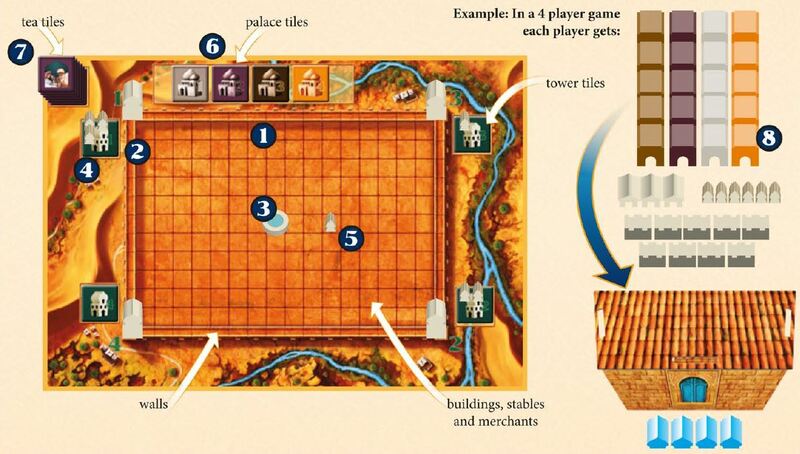 2 or 3 Player Game: If a neutral rooftop is placed on a purple palace, this is considered to be the same action as a player taken possession of a palace, but the tea tiles yielded are removed from the game. Example: In a three player game player A takes possession of the first purple palace and receives three tea tiles. A neutral rooftop is placed on top of the second purple palace. Two tea tiles are removed from the game. Player B takes possession of the third purple palace and receives one tea tile. It frequently happens a player does not want to place two wooden components for this may benefit the other players. In such a case a player can call for a tea break, provided he has tea tiles at his disposal. Instead of playing two wooden components, the player only places one wooden component and returns one tea tile to the box. It is not allowed to play two tea tiles in one turn. A player always has to place a minimum of one wooden component. Tea tiles score no points at the end of the game. The well is the source of life in the city. 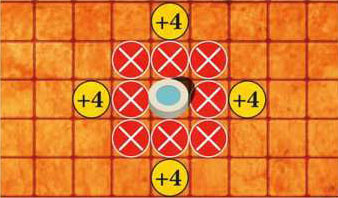 At the start of the game the well is placed on any space on the board. The well is subject to the same distance rule as the buildings. No build- ing or stable can be built on the eight spaces surrounding the well. Only merchants can be placed on the spaces surrounding the well. Example: On the red spaces around the well no buildings or stables can be placed, merchants are allowed on these spaces. Buildings or stables on the yellow spaces will score additional points at the end of the game. Palaces that are separated from the well by only one orthogonal space yield 4 additional victory points at the end of the game. Example: To increase the brown palace, you can place buildings or stables only on the green marked spaces. Its not allowed to place a building or a stable on the red marked space adjacent to the well. The first player who takes possession of a palace in a certain color receives the palace tile in that color and places the tile face up in front of their player screen. He keeps this tile until another player takes possession of a larger palace or enlarges a palace with a stable to create a larger palace in this color. '1 his person then receives the palace tile. The size of a palace is determined by the number of palace pieces and attached stables. Players holding a palace tile at the end of the game score the points indicated on the tile. 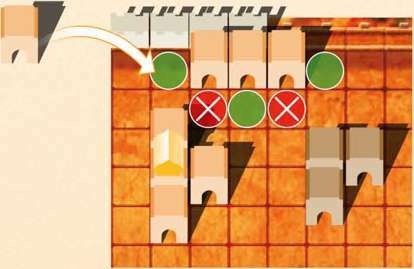 2 or 3 Player Game: A palace tile can also be won by finishing a neutral palace. In this case the tile remains at the edge of the board or is returned to the edge of the board if the tile was in the possession of a player. Example: Blue has already taken possession of an orange palace and owns the orange palace tile. The size of his palace is five (three buildings and two stables). Green places a rooftop on a new orange palace. The size of the new palace is four. Since this new palace isn't bigger, Green doesn't get the palace tile from Blue. But if he would enlarge his palace with two stables, he would get the orange palace tile from Blue. If a player takes possession of a palace directly adjacent to a wall connected to a tower, he becomes the watcher of that tower and takes the tower tile corresponding to the towers number. If there are merchants on the tower tile, the player places them behind their player screen. The tower tile is placed face up in front of the watchers player screen. If, at a later point in time, another player takes possession of a palace (regardless of its size) also adjacent to a wall originating from this tow- er, this player becomes the new watcher and receives the corresponding tower tile (but not any merchants on this tile). 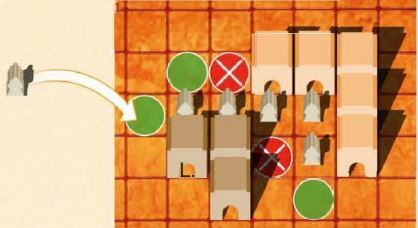 If a player has a palace bordering a city wall space with a wall component and any player rebuilds this wall at a later point in time so that it borders this palace, the owner of the palace also receives the cor- responding tower tile. 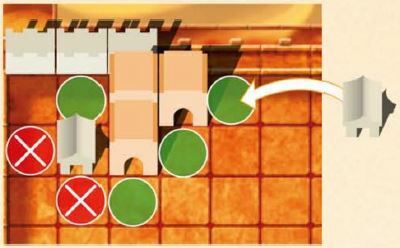 If a player has a palace that is one space separated from the wall, that player also receives the corresponding tower tile when this palace is extended by a stable that is directly adjacent to a wall section. So a tower tile is always taken by the last player who has claimed or has extended a palace adjacent to the wall. Often a tower tile changes from owner multiple times in a game. 2 or 3 Player Game: A tower can also be won by a neutral palace. In this case the tile remains at the edge of the board or is returned to the edge of the board if the tile was in possession of another player. If a neutral palace wins a tower tile with merchants on top of it, the merchants are removed from the game. Players holding a tower tile at the end of the game score the points indicated on the tile. 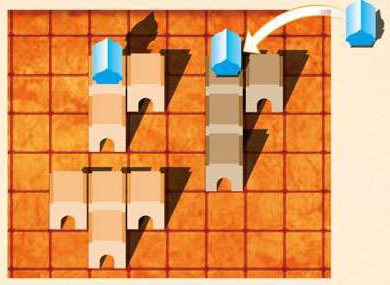 Example: Blue has taken possession of the brown palace which is placed directly adjacent to the wall originating from tower 1 and is therefore the first player with a building adjacent to that wall. He owns the corresponding tower tile. If another player takes possession of the orange palace, hell take the tower tile from Blue. Also, if Yellow places a stable between his grey palace and the wall, he ll get the tower tile of tower 1. Important: If a player takes possession of a palace and this palace is the first palace claimed by any player that is adjacent to a certain wall section, the player not only receives the corresponding tower tile but also the corresponding palace tile! However, he may lose these tiles to other players during the further course of the game. If a player does not have any components left, this player puts away their player screen and cannot take any further turns. The other play- ers continue until they run out of components too. If a player has only one component left, this player can obviously build only one component (instead of two). The game ends when all players have used all their components. Strategy Hint: It can be very advantageous for the last player remaining in the game to build a few more merchants or wall sections. To stay in the game as long as possible, you should place as many of your buildings as possible, collect a few tea tiles and capture additional merchants from the tower tiles. The player with the highest total of points wins the game. Palace: The orange palace is worth 9 points (4 buildings + 2 sta- bles + 2 wall sections + 1 merchant).The grey palace is worth 9 points (3 buildings + 4 wall sections + 2 merchants). The purple palace is worth 6 points (5 buildings + 1 merchant). 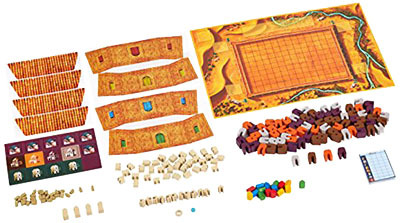 The brown pal- ace is worth 12 points (5 buildings + 1 stable + 3 merchants + 3 wall sections). Well: Additionally the owner of the orange palace gets 4 points, because a stable is one space separated from the well. The owner of the purple palace gets 8 points, because 2 buildings are one space separated from the well.